With the untimely passing of Paul Walker midway through the production of Furious 7, now in theaters, it was questioned for months how they would replace the unfinished shots needed with the star. Many stories were circulated including the complete scrapping of the film, but with the help of CGI and Paul's brothers Cody and Caleb Walker they were able to finish the movie and fill in the gaps that Paul had not yet finished.Universal Studios has created what could be toted as the largest and most profitable original film franchise of the last twenty years. Yes, the films has its quirky and outrageously unrealistic stunts but overall it's exactly what many go to the movies to enjoy. Over the last 14 years we have watched an undercover FBI agent and a street racer by the name of Dominic Toretto sweep the box office in the hunt for James Bond like stunts and action scenes. 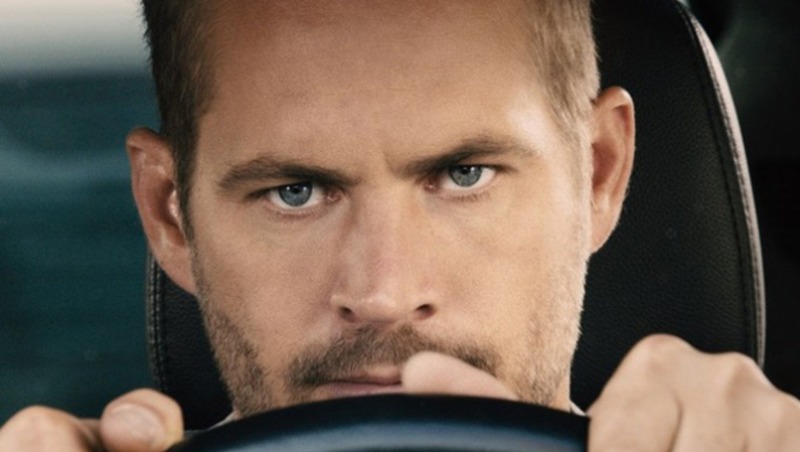 Though when the unexpected death of Paul Walker shook the world in late 2013 the movie was put on hold and then reworked to release almost a year later. It has been confirmed that WETA, the well known digital effects company, recreated Walker in the final scenes of the film. This is the same team that brought you Gollum in The Lord of the Rings and Caesar in Dawn of the Planet of the Apes. I have seen the film and could not find one scene in question outside of the one making the rounds on Twitter currently from one of the final scenes in the movie. At first glance and especially while in the theater I didn't think much of it until analyzing the image later that it was indeed a slightly different than what I had seen in the rest of the film. 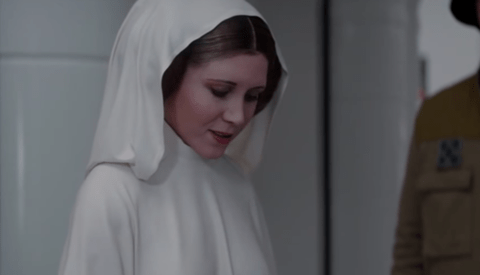 In my own opinion, I thought the movie was very well done considering one of the major stars passed midway through production. It's astounding what we can do with post production and Furious 7 paid outstanding respect to a fallen costar in the best way possible. What do you think? Do you see the difference, or would you have noticed while in the theatre? Now, this is not a new trick production companies are pushing out but of course it's become much easier to pull off with companies such as WETA at the helm. 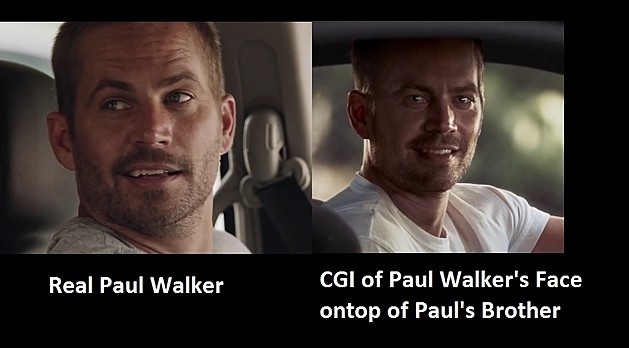 Check out more of their work at the link provided and be sure to sound off in the comments below as to what you think about the added scenes of Paul Walker. This reminds me of the newer TRON movie where Jeff Bridges is young again...I was blown away by that. I was also blown away when they had Tupac on stage at Coachella. I mean you could tell something was different...but man it was SO CLOSE. I honestly think at some point in the future the folks that own the estates of fallen celebrities who are still bankable will lease the likeness of those people. This is a prime example why Robin Williams had he's image protected for 25 years after his death. His skin in the 3D example is really reflective. In comparison to the other pic where it is matte. I haven't seen the film yet so...grain of salt. I think, that this is because of harsh light. On the left side light is softer. The problem with saying that is that "Harsh light" on a production with this big of a budget is something that would typically have been fixed prior to shooting. They could/should have balanced the lighting across his face instead of such strong shadow and clipped highlights. Plus he is wearing a white shirt in that image. Surely there would be a semblance of light bouncing upwards. A quality of light they seemingly didn't account for when they used the probe to make an environment map. They also did this in Attack of the Clones for some of Christopher Lee's fight scenes; just pasted his face on the stunt double. Furious 7 was absolutely heart breaking for me. At 26 (almost 27), I’ve been following the franchise since it’s creation, so you can say it’s basically been the majority of my life. Watching such a beloved actor pass away in such a tragic was was terrible, but I think the Franchise did a great job keeping Paul’s memory alive in the movie. Kudos to everyone who made that happen, including the CG artists. I felt sad just watching the trailer knowing what happened to Paul Walker! I'm the same age as you so I've grown up with this series as well. I haven't watched the movie yet but I know I'll probably shed a tear or two when I do! 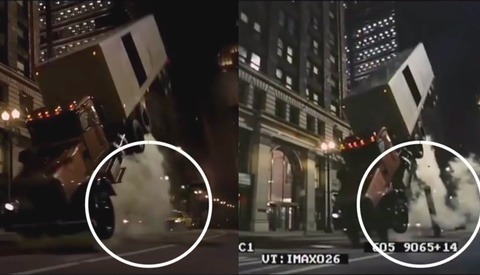 I think the first example of this was when they used similar technology to finish The Crow from 1994, when Brandon Lee (Bruce Lee's son) was accidentally killed during the filming. I haven't seen Furious 7, but I can only imagine how things have progressed in 20+ years. It just seems that his head is melt with the ceiling of the car (I guess it comes from the framing). Except that, it's really impressive ! From what I've read Ip Man 3 is going to use a completely CGI Bruce Lee. They still have some issues with his estate though so will be interesting if it does happen and what the final product is like. It was definitely a touching send off. Watched it in XD, and the only scene I noticed a difference was the scene described. He sparkled like a twilight vampire in the setting sun. 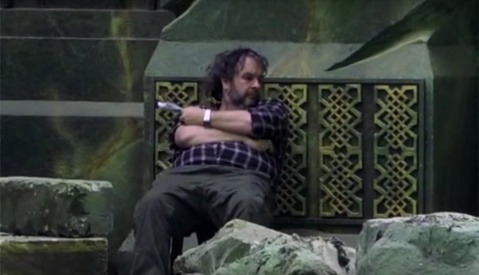 I wasn't too bothered by it though because I knew that had to have been a reworked scene and I thought it was a touching, appropriate and symbolic way to send him off. To afterward learn that was his brother in the drivers seat is very classy. Well done universal. I noticed in the trailer that Paul looks a bit strange, but when was actually watching the movie the transition was doe so smoothly that my eyes did not notice anything.